The first abstract painting. Yes, you read that right. Wassily Kandinsky's Improvisation 31 (Sea Battle) is credited with the coveted title of the very first, entirely abstract painting. Why did Kandinsky decide to throw caution to the wind and create an entirely abstract painting? 1913 posed to be a year where he began exploring the unconscious and spontaneous expression of one’s inner character. Ironically, Kandinsky finished Improvisation 31 (Sea Battle) on the eve of the First World War although he denied the painting was prophetic to beginning of it. But, I wouldn’t entirely believe the artist. I know, we are supposed to believe everything they say regarding their art but sometimes, they’re wrong. Hear me out. Even if Improvisation 31 (Sea Battle) was not a direct reflection of the beginning of World War I, it does hint to Kandinsky’s world view at a time that humanity stood on the brink of a new era. And even though he denied his painting had anything to do with the impending war that began literally the next morning, it’s kind of suspect that we are to believe the first full abstract painting at the time had nothing to do with existential crisis of The Great War. I’m skeptical. But alas I should do Improvisation 31 Sea Battle some justice and tell you dear reader what this painting is truly about, within reason. Many art historians believe that Improvisation was probably inspired by the apocalyptic imagery of the Book of Revelations. Since 1910, Kandinsky was borderline obsessed with the apocalypse as described in the Bible. So, what gives? In the Book of Revelations, one of the major themes is not only that God is sovereign, but judgement is inevitable. In short, one day God is going to be very pissed. The sin of humanity will have reached a breaking point, Satan will be destroyed, all false religions will be vanished from the world and only Christians will persevere. Luckily for us secular heathens, God will have mercy on our souls if we decide to believe in Him and eternal life. If not, we’re all damned. How fun. So, many theorize that Improvisation 31 (Sea Battle) is Kandinsky’s reaction to the Book of Revelation and his deep belief that the world was about to change drastically. However, I doubt Kandinsky knew the horror that would takeover for much of the 20th century. But what do I know, let’s just listen to the artist! Dever, Mike. Book of Revelation. Edited by Theopedia. Accessed January 4, 2019. https://www.theopedia.com/book-of-revelation. Ford, Aleid. 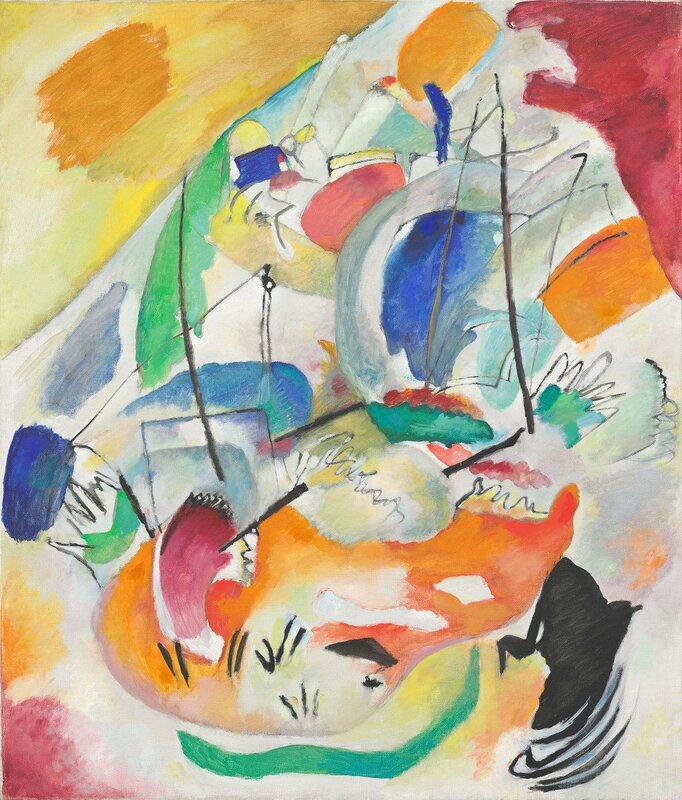 “Permanent Collection: Kandinsky’s Improvisation 31 Sea Battle.” DCist. June 8, 2010. Accessed December 21, 2018. https://dcist.com/story/10/06/08/permanent-collection-kadinskys-impr/. Griffin, Eve. “Wassily Kandinsky Artist Review and Analysis.” The Art Story. 2019. Accessed December 21, 2018. https://www.theartstory.org/artist-kandinsky-wassily-artworks.htm. Heller, Reinhold. “Kandinsky and Traditions Apocalyptic.” JSTOR 43,1 (1993). 10.2307/776628. “Improvisation 31 (Sea Battle).” The National Gallery of Art website. Accessed December 21, 2018. https://www.nga.gov/Collection/art-object-page.56670.html.